KC TRUCK PARTS FOR YOUR HEAVY DUTY CLASS 8 TRUCK PARTS. VERY LARGE TRUCK JUNK YARD/HEAVY DUTY CLASS 8 TRUCK WRECKING/SALVAGE YARD, AND TRUCK RECYCLING. LOCATED IN THE GREAT NORTHWEST. NEW AFTERMARKET PETERBILT STYLE HEADLIGHT HARNESS’S, (PAIR) FITTING PETERBILT TRUCKS WITH SINGLE LARGE RECTANGLE HEADLIGHTS WITH SIGNAL LIGHTS ON END OF ALUMINUM PODS. Track Page Views With. Auctiva’s FREE Counter. 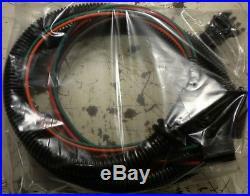 The item “PETERBILT 378 379 SINGLE LRG HEADLIGHT WIRE HARNESS 16-07412 (1-8008)(PAIR)” is in sale since Thursday, March 15, 2018. This item is in the category “eBay Motors\Parts & Accessories\Commercial Truck Parts\Lighting\Headlights”. The seller is “kctruckparts509″ and is located in Spokane, Washington. This item can be shipped worldwide.